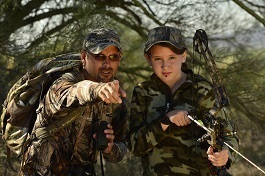 PHOENIX – The Arizona Game and Fish Department is accepting applications for $75,000 in annual grant funding for local sportsmen’s organizations to provide public, hands-on projects focused on the retention of new hunters and anglers. The priority funding focus of this year’s Local Sportsmen’s Group grants program is on hunter-angler development and retention through progressive skills development. A new category has been added for projects that provide a base camp or “meet-up” for experienced hunters or anglers from past projects who no longer need mentored training. These are individuals seeking social support, defined times, destinations and gatherings. Projects and events that involve the pursuit or harvest of wildlife or fish with a license are being requested. Grants will be awarded through a competitive application process and must be open to the public. The new online application submission and instructions are available at www.azgfd.gov/LSG. Applications must be received no later than 11:59 p.m. (Arizona time) Aug. 15, 2018. Paper applications are available on request from Doug Burt, hunting and shooting sports program manager, at dburt@azgfd.gov, or calling (623) 236-7402. Burt said there are many local organizations that do great work, but lack the funding to carry out the important mission of passing down the hunting and angling heritage to the next generation of wildlife conservationists and stewards. “This grant program is an investment in local organizations that, day in and day out, are teaching people how to be safe, ethical and responsible hunter-angler conservationists,” Burt said. There is no cost to Arizona taxpayers for this grant program. Game and Fish does not receive any of the state’s general tax funds and operates under a user-pay, public-benefit model. The grant program is an investment in the continuance of wildlife conservation efforts and outdoors recreation participation in Arizona. To learn more about how hunters, anglers, shooters and boaters fund wildlife conservation, visit www.azgfd.gov/h_f/federal-aid-cycle.shtml.